We started 2018 off on a high note by helping set up two new guitar programs in Fort Worth, Texas. Working with the local non-profit Guitar Fort Worth, we donated 16 Cordoba guitars along with the footstools and strings needed to get the programs rolling. 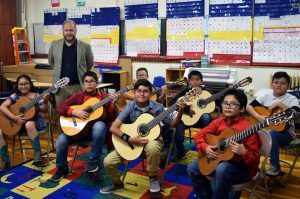 Over the next few years, Guitar Fort Worth will be overseeing the development of these programs and providing regular lessons taught by volunteer graduate students from local universities. We are fortunate to be working with such a wonderful organization and one who has already done so much to earn the trust of the community. One of the schools we are supporting is Sam Rosen Elementary (pictured below) which serves a low socio-economic community and has a minority enrollment of 98%. Most of these students would never have been able to afford a new guitar, let alone pay for regular lessons on their own. Seeing their smiling faces as they play these beautiful instruments for the first time is definitely the most rewarding part of what we do. We know they will serve the students well for many years to come. In the meantime, we look forward to hearing these students perform soon!